If you’re heading to Pamplona for the Running of the Bulls this year, you’re in for the trip of the lifetime! But before you go, you may have a few questions. For instance: Where is Pamplona? How to I get there? Where else should I check out in Spain? Here is everything you need to need to know about traveling to and around Pamplona. So pick the international flight that is best for you, and browse the options below for getting to Pamplona from either Madrid or Barcelona. By and large our guests choose to travel via train to Pamplona because it is comfortable, quick, easy to navigate, and cost effective to boot. The national train of Spain is named Renfe, and they have a series of trains that frequent Pamplona, especially during the San Fermin. Rail Europe is based in the US and usually has a slightly higher rate than buying directly from Renfe. However, we would not be doing our job if we didn’t share that the Renfe website is notoriously full of errors and confusing translations. It might be worth the extra pennies for the peace of mind to book with the domestic company. You can buy train tickets once you arrive in Spain as well, just do not expect to have the most ideal path. The non-stops are usually sold out, so you will have a layover in a city such as Zaragoza, where you will need to board another train. When purchasing tickets in Spain, there will be an English option at each ticket kiosk. Travel tip: Buying a round trip train ticket instead of two one-way tickets comes out to about 20% cheaper. If you are positive about your travel times and dates, you can get discounts for buying round-trip tickets in advance. Just keep in mind that these tickets are typically non-refundable. Madrid is home to the largest airport in Spain, so you will likely find more flight options here than any other city in Spain. If you are flying into Madrid–Barajas Airport (MAD), here is how you would find your way to Pamplona. There is a frequent roundtrip train that runs from Madrid Atocha (the city’s main train station) to the airport. The cost is about 3 Euros per person each way, and the train picks up and drops off at Terminal 4 (T4) at the airport. The trip between Atocha and the Aeroporto will take about 30 minutes each way. Once at Atocha, you are able to take trains all over Spain, including Pamplona. The trip from Madrid to Pamplona is typically 3 hours non-stop. Since public transportation is so prevalent throughout Europe, you can expect a clean and safe bus to get you to Pamplona. There will be numerous starting options throughout Madrid, including one at the airport, but there will only be one station in Pamplona that is located just 800 meters from our hotel. The Pamplona bus station is identified as “Pamplona-Iruna” and tickets can be purchased here. The drive from Madrid to Pamplona is 240 miles and takes around 3.5 hours. There isn’t much to see besides fields of crops, and be prepared for seemingly non-stop roundabouts. However, as you approach the city of Pamplona, there are some ancient aqueducts that are pleasing to the eyes. The Pyrenees Mountains serve as a nice backdrop once in the Iruna region. Travel Tip: Be sure to remember that manual transmission is the norm in Spain, so if you do not know how to drive a stick shift, be sure to rent an automatic car. Rental car companies rarely have automatic cars readily available in their lots, so this isn’t always an easy fix in case you accidentally rent a manual transmission. Barcelona is home to the second largest airport in Spain, and is a popular destination for our clients during their travels. Here is how you get to Pamplona from Barcelona. One of the major train stations in Barcelona is called Sants (Estacion Sants), and you can get there via tram directly from the Barcelona Airport. The trip from Sants to Pamplona is typically 3.5 hours non-stop. The Pamplona bus station is called “Pamplona-Iruna” and tickets can be purchased here. There are many buses departing from all over Barcelona, including from the airport and the central train station. It is a 270 mile drive from Barcelona to Pamplona, but if you love roadtrips, this is a stretch with lots to see! Check out our blog post detailing some of the best sights and detours that lay along the way between Barcelona and Pamplona. Travel Tip: As mentioned before, be sure to remember that manual transmission is the norm in Spain, so if you do not know how to drive a stick shift, be sure to rent an automatic car. Rental car companies rarely have automatic cars readily available in their lots, so this isn’t always an easy fix in case you accidentally rent a manual transmission. The best way to get to San Sebastian from Pamplona is via bus (about an hour). During the month of July, there are frequent buses to/from Pamplona almost every half hour. Here is information about the bus schedule, and here is where you can book tickets ahead of time. Travel tip: We should mention that you should not plan to stay the night in San Sebastian if you want to attend the bull run in Pamplona the following morning. The first bus will get you into town after the bulls have already come and gone! The train station in Pamplona is located 2.5 miles from our hotel, and there is usually a line of cabs out front during San Fermin. Expect to pay about 5-10 Euros for the transfer. You can walk as well, but with bags and the craziness that will have already ensued in Pamplona, it is much simpler to get a taxi and save your feet for exploring the town! We used to offer transfers from the airport/train station, but with so many people coming in and the inevitable delays that take place in the Spanish transportation system, it makes much more sense for you to find your way to the hotel, and we’ll meet you there. Located on the edge of Park Ciudadela, this underground station is ideally located just a short walk away from the AC Ciudad de Pamplona hotel. There are ticket kiosks where English is an option for those looking to book bus tickets on site. If you prefer to have your bus tickets sorted out ahead of time, you can also purchase them online here. 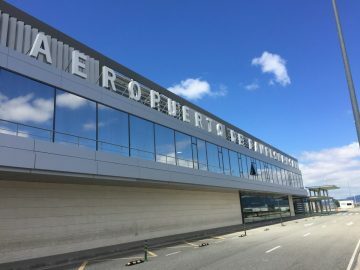 This is sometimes not considered because many people do not realize that Pamplona does, in fact, have an airport, its code being PNA. It may have only two gates, but there are daily flights from both Madrid and Barcelona. In 2017, the airlines that included Pamplona in their destinations were Iberia, British Airways, and Vueling Airlines.The good part about this is the flights are competitively priced and don’t cost much more than taking the train. The bad news is that the majority of the flights are in the afternoon or later. Considering that most of the flights coming from the US land early in the morning, you can expect a hearty layover in either Madrid or Barcelona. If you just keep moving, you can sometimes arrive in Pamplona faster via train or bus. We had a 15 person trip to Oktoberfest this September and the whole trip, end to end was brilliant. All of our party was more than pleased with all aspects - Bucket List Events exceeded our expectations and we are thankful for such a fun and smooth trip!! "Me and my friend recently booked a trip with Toby and his crew for the running of the bulls and needless to say it was fantastic. Everyone worked so hard to make the trip as easy and fun as possible. They completely took the guess work out of the whole trip. One of the best trips I ever took and I will be booking my next event with them for sure." Traveled with my parents, wife, and two oldest boys this year and Bucket List Events did not disappoint. First class service! The Hospitality area and base camp were fantastic. Shuttle to and from the course made it stress free. Wednesday practice round allowed my sons to high five the vast majority of current players and legends of the game. The North Augusta home that was secured for us was nothing short of amazing. I would not hesitate to use Bucket List again and quite certain my family will on other future events. Toby & co. put together an incredible Pamplona experience for a large group of us. Can’t recommend them enough. The team at Bucket List Events saved my bacon when my son and I wanted to go to the 2018 Champions League Final in Kiev. The logistics of arranging the tickets, accommodation and ground transport for such an event can be harrowing if ‘going it alone’, to say the least (we tried!). When we found out about Bucket List Events they made it entirely stress-free. The whole package - top-notch seats at the stadium, accommodation in the perfect location, airport transfers and guided tour of the city was brilliant. Our Masters experience was wonderful. Brian and his staff were great and the accommodations superb. A true Bucket List event! Bucket List Team - We thoroughly enjoyed our trip and getting to know you guys. My husband was able to accomplish one of this dreams. We look forward to another Bucket List trip with you guys in the future! G'day from Sydney! - Bucket List Events looked after my family for Comic-Con San Diego last year and it was fantastic - many thanks! Loved our Oktoberfest experience with Bucket List events! Our small and large tent reservations were perfect and watching the parade from our hotel window was icing on the cake. Toby and team were excellent hosts - insuring our Oktoberfest time was a ton of fun?